CookingShorts has re-invented the apple pie! Well, maybe not, but we are super proud of this fun twist on a classic. We took all the flavors that we love from our favorite Thanksgiving dessert and instead of filling up a pie shell, we stuffed them inside of a tart, Granny Smith apple. This is a really fun treat on a crisp autumn night. Preheat oven to 425. Fill a medium prep bowl with cold water and lemon juice. Use a paring knife to trim off a small portion of the top and bottom of each apple. Use the knife to cut an outline around the core of the apples. Use a spoon to “dig” out the core. By leaving the bottom intact, you turn the apples into a bowl. Once the core has been removed, place each apple in the bowl of lemon water – this will prevent the apples from browning. Remove the apples after about 5 minutes and allow to drain (core side down) on a paper towel for 10 minutes or so. Pat the outside of the apples dry. In a small prep bowl, mix the next 7 ingredients together and stuff each apple with filling. Bake 20 minutes in a small oven safe dish. 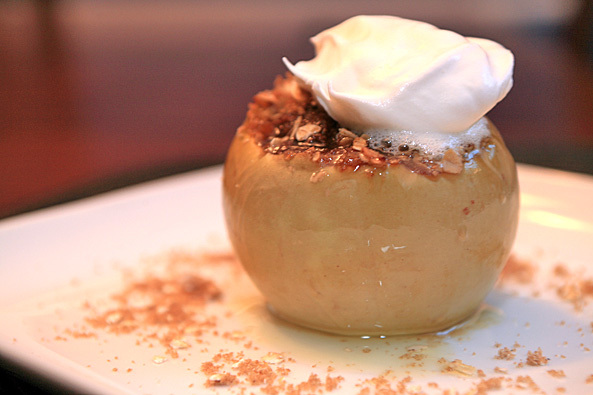 Transfer apples to small bowls with a spoon and top with whipped cream.